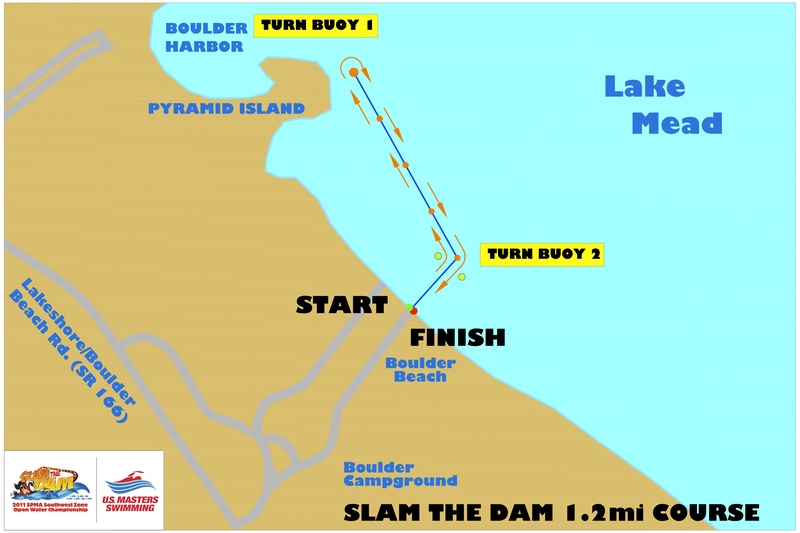 The 2013 Slam The Dam Open Water Swim Has Been CANCELED. Our safety crew will be setting up the buoys at Boulder Beach throughout the day. You are welcome to go for a swim, but please stay inside the white buoy line. There is a $10 fee to enter the park, good for 7 days. General maps and directions can be found HERE on the FAQ page. 11:00 am Course closes for all swimmers. SPECTATORS WELCOME!- Feel free to spend a day at the beach! Bring chairs, pop-up tents, umbrellas lunch and drinks. There are no concessions at the beach. Water/drinks/lunch are for participants only. Be kind & friendly to your volunteers, fellow swimmers and race directors!-Unsportsmanlike conduct is a no-no. Swimmers: You will be given race tattoos! Please refrain from applying sunscreen until AFTER you are body marked. Do not walk barefoot on the beach. Do not enter the water until daylight. Pre-Race meeting is at 7:45 a.m. near the start line. All swimmers must be accounted for prior to entering the water. Swim straight out to the green buoys and turn left. Keep the buoys on your right shoulder. Keep buoys on your RIGHT shoulder. Complete Turn into shore at the Green Buoy. LEFT to the finish line. Do not cut the course. Your time ends when you cross the flags, and are met by a volunteer.